We are a locally owned company who has been servicing all of Georgetown and Horry counties for over 20 years. Give your home a facelift when you replace that eyesore garage door with a sleek wooden one. Ask for a free estimate and measurement on your garage door installation from A&A Garage Door Solutions. You don't have to fuss with that broken garage door anymore. 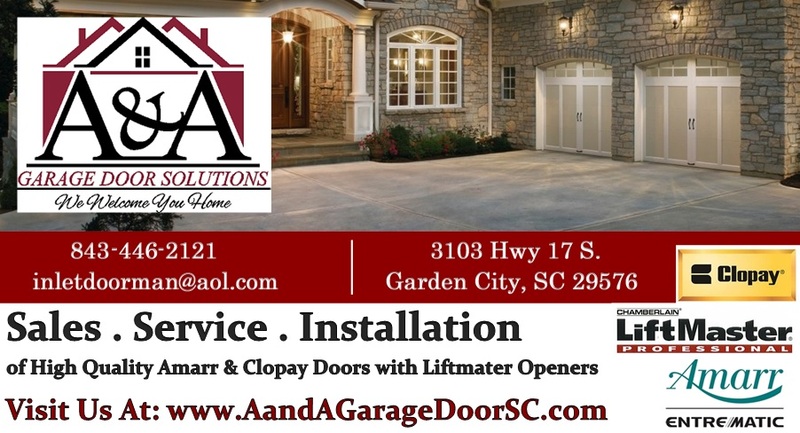 If you need garage door repairs in Murrells Inlet, SC or Garden City, you can count on A&A Garage Door Solutions to do the job right-and get it done fast. Secure your company's assets when you opt for commercial garage door installation from A&A Garage Door Solutions. We have the industrial-strength attitude (and equipment) to handle your job from start to finish. You keep pressing and pressing your garage door button, but something just isn't registering. No matter how hard you press that button, nothing's going to help. When you need professional help for your garage door repair, call A&A Garage Door Solutions, Inc.
Is your garage door too far gone? We do installations, too! Opt for a new garage door from A&A Garage Door Solutions. Call our location in Garden City, SC at 843-446-2121, or our Murrells Inlet, SC shop at 843-455-3688. We service Murrells Inlet, Pawleys Island, Georgetown, Garden City, Surfside Beach, Myrtle Beach, and Conway, SC. You love to build homes for folks on the east coast. But with an increasingly competitive market, you need a service that sets your homes apart from the rest. Opt for luxurious wooden garage doors on your new home construction from A&A Garage Door Solutions. Call us today and we can begin a working relationship. Call us today at one of our locations below to get started. We service Murrells Inlet, Pawleys Island, Georgetown, Garden City, Surfside Beach, Myrtle Beach, and Conway, SC. Contact A&A Garage Door Solutions, Inc. Today!